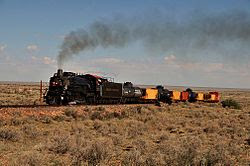 One of the things I want to do is to jump aboard the Grand Canyon Railway to a historic ride to the Grand Canyon. This Polar Express type experience offers four different packages which start in Williams, AZ, and travels to the Grand Canyon National Park. Today, we can take the same route that generations before us traveled. In 1901, and when Arizona was just a territory, the Grand Canyon trains would take folks to the south rim of the canyon for a fun excursion. The train offered a nice comfortable trip to the Grand Canyon for all men, women and children. Some would choose to make it a day trip, while others decided to take a room at the lodge. These people stood at the rim and were taken in by the extraordinary beauty of the canyon much like we do today. In 1968, the trains quit traveling to the Grand Canyon when automobiles became trendy. People were opting to drive themselves to the park instead of spending the money on the train ride. In 1989, a group of businessmen purchased the Grand Canyon Railway, revamped the train, and found renewed interests from people wanting to take the historic ride. Today, many sit in comfort to take a fun day trip or several days’ vacation using the Grand Canyon Railway as their mode of transportation. If you are interested in booking a ride you can go to their website, http://www.thetrain.com/ or call 1-800-THE-TRAIN. I've taken that ride a few times and every single time, I'm the woman the cowboys pretend to abduct. Haha. It's the only way to go to the Canyon, I think! I would like to do this at least once. It looks like fun and you don't have to drive; just kick back and enjoy the scenery. It would be a ton of fun to ride a railroad to the grand canyon. I'm glad they bought it back. Me too. The view from the train is supposed to be spectacular. I would love to try this sometime! I just saw a show about tourist railroads the other day on PBS. I would love the wild west experience.